If you are ready to restore your smile with dental implants, your first step is choosing a dentist who offers dental implants in Ocala, FL. Dental implants provide an alternative solution to treat tooth loss using the only option that offers a nearly 100 percent success rate. The success of dental implants largely relies on your candidacy for the procedure, as well as who performs the procedure. With a qualified implant dentist and the right aftercare, your dental implants will last a lifetime. Dental implants are a form of tooth replacement that replaces both the root and crown of a tooth. To benefit from dental implants, you will need to undergo a multi-phased treatment. To begin the process, you need a consultation with a dentist in Ocala, FL who specializes in implant dentistry, like Dr. Daniel Weldon. Dr. Weldon will evaluate your tooth loss, oral health, and medical history to determine if dental implants are right for you. 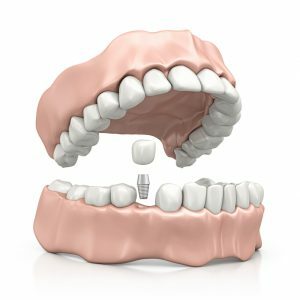 If you are a candidate for dental implants, the first phase of the implant process will require surgically inserting titanium posts into your jawbone to replace the tooth roots. The jawbone will fuse to the implant posts to create a sturdy foundation for the replacement tooth while also stimulating bone growth. After your jawbone has healed to the implant posts, you will need a second surgery. The gum line will be opened to place abutments on the implant posts. Abutments are needed to anchor the prosthetic crowns in place while also allowing the gum line to heal for a natural appearance. About 2 weeks after the abutments have been placed, you will have the final phase of the procedure. The final phase involves attaching the custom-made dental crowns to the implants to fully restore your smile. Once your produce is complete, you will need to visit your dentist every six months for regular dental cleanings and checkups. At each appointment, we will check your implants to ensure they are still functioning as intended and no complications have developed. When choosing a dentist to handle your implant procedure, you need to find a dentist who specializes in implant dentistry, like Dr. Weldon. Dr. Weldon is specially trained in implant dentistry and a fellow of the International Congress of Oral Implantologists. In order to achieve this accreditation, a dentist must undergo extensive academic training in dental implants. Dr. Weldon’s academic and professional success has made him a preferred choice for dental implants in Florida. If you are ready to replace your missing with dental implants, you are making a wise investment in your oral health. With the right implant dentist by your side, you will have a successful, lifelong solution to treat your tooth loss. To begin the process of dental implants to treat your tooth loss, contact our office today to schedule a consultation. Dr. Weldon will help you throughout the entire process for a stress-free experience.